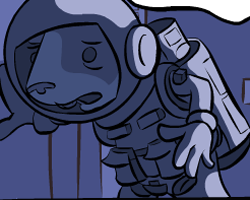 At the time of my choosing to give Jeff Mumm’s existentialist time-travel sci-fi anthropomorphic webcomic “featuring Talking Guinea Pigs!” a write-up, he was trying what I considered to be a rather interesting experiment. So when I came back for later observation, I was rather sad to see he had abandoned the exercise. Though I suppose, perhaps, doing so answered the questions that he presumably had — and that I myself had been musing on for some time as a webcomicker, myself. A bit of background first. “featuring Talking Guinea Pigs!” does exactly what it says on the tin, though likely not in the way one would be expecting. Our protagonist, Jeremy, is a space-traveling guinea pig who has rather unexpectedly found himself on Earth — in Russia, specifically — in the 1800s. Finding his way home would be difficult enough, but he’s also in amongst existentialist thinkers who have started making him question why he should go home, never mind how. “featuring Talking Guinea Pigs!” is in full-page format and came out, for a while, three times a week. However, as is the case with many webcomickers today, Jeff Mumm seemed to have found himself battling deadlines. So, in attempt to end the struggle between regular vs. quality updates, he launched “Cagin’ It,” a simple three-panel comic using repeated art and a joke-a-day format. “Cagin’ It,” featuring talking guinea pigs (of course), ran just underneath its parent comic on the main page, and filled the gap between major updates in the meantime. A bit after that came “Sketchy People,” four panels at a time in unfinished (and usually colored) sketches. For now, it just became clear that doing even those simple comics was taking time away from what I should have been spending on the main comic. They take just enough time to be impractical. Which seems to be the trend in webcomics these days. On-schedule and high-quality is the ideal, but there’s been an increasing priority shift between quality and regularity within the past year or two. Many people ending projects and moving on to new ones are finding themselves subscribing to the “updates when it’s ready” schedule. Really, the only problem there in the past — provided the artist was up-front about their schedule — had been ease of tracking updates for readers. But with RSS feeds becoming easier to use, or Twitter used to the same end, the likelihood of losing one’s readership to an irregular schedule is decreasing steadily. Whether this will become the new normal anytime soon is hard to say, but with artists experimenting and moving towards a bit more free-form work, it’s likely at least going to increase. It’s certainly helping the artists themselves do their best, for a start. “featuring Talking Guinea Pigs!” stands alone on its site now and is in its sixth chapter. I'm fascinated by the update conundrum, because one of the things I recall hearing at a Webcomics panel back in 2004 is that if you wanted to keep a readership, regular updates were the key. In my personal mind, it's those artists who have been able to maintain a regular update schedule while holding down a full-time job (that is not the comic) who earn major respect from me. Incidentally, Tom Brazleton at “Theater Hopper” announced he was scaling back to one strip a week because he just started a full-time job again; considering he's got a new baby to support, I don't fault him for that choice, you know? It's very true and that's pretty much how I've been doing it. Thus it's interesting to see the shift, and I've noticed it's almost exclusively for GN-style pages (see also “Sledgebunny,” “Xylia,” and pretty much anything by Richard Morris). Re: the first of those three, as I said in my first CN-S column, it's a matter of 'warming up' to the new style. And with “Xylia” it's the real-world responsibilities again — though every page she does is an in-depth freakin' work of art so the fact that she turns them out in the first place amazes me. I really did like the idea of 'low-impact' stuff as a way to keep regular content running, personally. Mileage may vary in this case, I suppose.